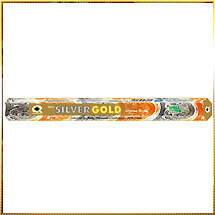 This "Silver Gold" Incense Stick offered by us glorifies our entire collection of Exotic Series. Its enchanting fragrance is derived from natural herbs, biotic & aromatic materials, essential oils, and fresh flowers. The fragrance is profoundly preserved through air-tight packaging we offer to it. At the same time, packets are very eye-catchy. Moreover, we offer Silver Gold Incense Sticks at highly competitive prices.